Que tal amigos. This week is transfer week. And as expected, I am moving to another area. But surprisingly to one I've already served in. I'm going back to New Brighton! I served there for three months back in January of last year. It's a Spanish-magnet ward just north of downtown Minneapolis, and I am super stoked to be going back there! I'm going to miss Faribault a ton though. All the people I have met and the wonderful members here, it was a wonderful experience. This week on Wednesday we helped our mission housing coordinator move a ton of furniture for new missionaries in a tiny town called Albert Lea. That took up most of the day, but afterwards we were invited to come to youth-night at the church. 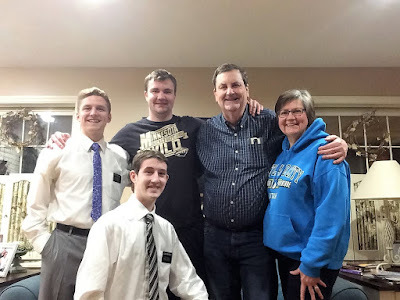 They are doing a missionary month and we got to explain what it's like to go on a mission and teach others about the gospel of Christ. They only have one missionary out from the ward right now, so they don't have as many examples to look up to like I was blessed with. We also had another sweet family home evening with a few families in the ward who also invited friends! It's going to be hard to say goodbye! Many of you probably already know, but with the recent passing of our church president and prophet Thomas S. Monson I've been reflecting a lot about his example and character. He truly lived a Christlike life and mastered the principle of being guided by the spirit to reach out to those in need. Just a little quote I love from him that I read: "Unless we lose ourselves in service to others, there is little purpose to our own lives". When we give our time, love, and attention to those around us we will find a greater sense of joy and purpose to our lives. I know he was a prophet of God.